Seamless Piecing: Sassy Sudoku Quilt - Use your Stash! Sassy Sudoku Quilt - Use your Stash! Hey there online friends! Thanks for stopping in. How are you coming on your Sassy Sudoku quilt? Have you chosen fabrics yet? That's often the hardest part for me. Choosing for this quilt was easier because I knew my fabrics didn't necessarily have to "match", or even "coordinate" for that matter. So I dived deep into my stash and found anything that was a half yard cut and would probably never find a home anywhere else. You know the ones I'm talking about. They are the fabrics you've tried to use in several projects, but they just never quite belong. You may be surprised, when you start digging, how many of those fabrics you have. I was. Well, pull them out and use them. This is where they belong. One great fabric choice is blenders. That's where I started first. I easily came up with this grouping before I decided I really didn't want to use that many blenders which can easily find homes elsewhere. Craftsy carries great blenders in bundles. 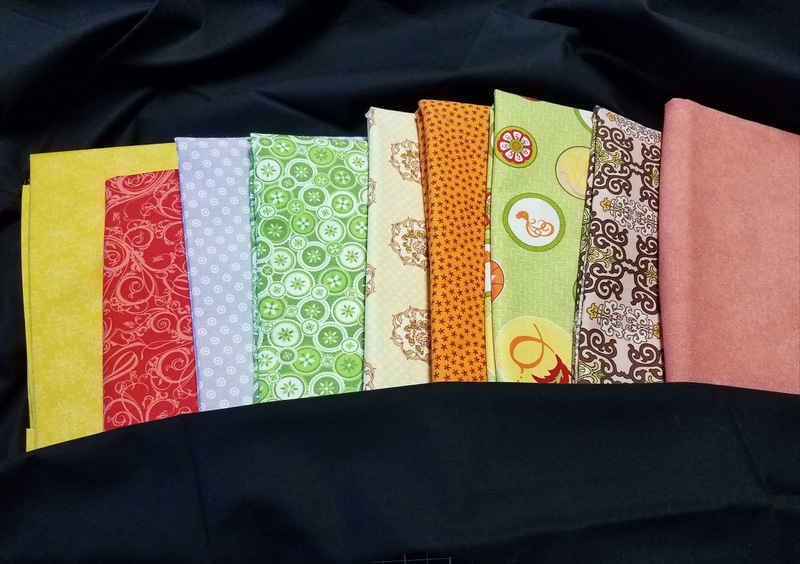 Windham Fabrics makes a beautiful blenders bundle. That's where the fabulous Gold fabric in my quilt came from. I loved it so much I overbought. Do you love I Spy quilts? Sassy Sudoku would be great as an I spy quilt. Just avoid having too many backgrounds the same color. Also avoid fabrics that are too similar, or too dissimilar. For example, civil war prints and novelty prints would both be great choices, just not in the same quilt. While fabrics all from the same fabric line can sometimes get too "matchy-matchy". 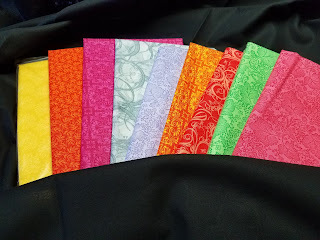 How about solids, or batiks? You don't want your grid to become "muddy", which can sometimes happen with batiks, so make sure your choices aren't too blendy. (Yes I did just make up that word. Blendy. You know what it means, it's sort of like "matchy-matchy.") Well saturated batiks would be fabulous. This is what I chose in the end. Pay attention to your black background. Not all black fabrics are the same, some have a little red tint, making them appear brown. Some have a matte finish so they don't pop like you want them to in this quilt. The black I'm using is from Connecting Threads. It's a nice, glossy black. (Not as glossy in real life as it is in the pic.) Whatever I put against it is going to look great. Now, a word about thread..
You have a couple of options for quilting here. You could use matching threads for each of the blocks and just change colors a lot. The advantage of doing so would be keeping your colors clean and crisp. There is something to be said for that in this type of a quilt. You want to keep your colors as different as you can so you don't lose the Sudoku-ness of the quilt. The cons of that plan, for some of us, are obvious. If you are quilting the project on frames, changing the thread that often is impractical. If you are doing free motion on your domestic machine it could work, but chances that you own all the colors necessary to match 10 colors is unlikely. When is it time to shop for thread? For some folks, like Angela Walters, the answer to the question is "ALWAYS!" For others, myself included, the answer is more complicated. I'm willing to shop for new thread if I'm quilting an "important" or "special" quilt, or ... if my mom is going to see it. (Anyone else have that issue?) As a rule however, when choosing thread I use two criteria, and there is one deal breaker that will send me to a store. Criteria #1. Do I already own a thread that will do the job? This one trumps everything for me. I'd rather use a thread I have than shop for the "perfect" color/brand/weight etc. I know some of you are steeped in a rich heritage of retail therapy. That's great for you if it's working. That's how most of us keep the gene pool of our stash healthy. It's also the way I came to own an entire room of scrapbook supplies that will become landfill when I die. The older I get, the less likely I am to shop if I don't have to. Criteria #2. Does the thread interact well with all of the fabrics in the quilt? As much as I don't like to shop, there is something I like even less. That's cringing every time I look at a quilt, knowing that the thread was a bad choice. Once that quilt is quilted, the thread choice is forever. Never accept ugly. And the Deal Breaker. When do I accept that I'm going to have to shop for thread? 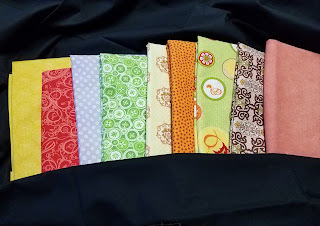 If I throw a few feet of thread over my quilt and I see anywhere it's going to jump of the finished quilt and bite me, it's time to shop. This was a concern with the Sassy Sudoku quilt; I wanted thread that would blend with all the colors AND look good on the black background. Those two things are not an easy ask. I recently quilted an Americana quilt with a terrific Gold thread. The quilt had dozens of fabrics in it, including Navy blue sashing between the columns of blocks. Gold and green fabrics had been used as accent colors with the Red, White and Blue blocks. I shopped for thread for that quilt because it had taken me a year to piece it and I wanted to quilt it with the "right" gold. I purchased 4 colors of gold/brown thread from 3 different locations. I found a gold I loved with the navy strips and the quilt turned out fantastic. When auditioning thread for the Sassy Sudoku quilt I wondered if that same gold (the cone in the middle) could produce the same result against black. The test resulted in a firm NO! It definitely jumped off the quilt and bit me, and not just on the black. I didn't like it with the colors either. I was disappointed. I also tried a natural white that I like to use. (bottom cone) Again, no. It was great on the color fabrics, but it shouted "BORING!" on the black background and made it look sad. I used it on the back of the quilt where there is no black, just a giant 9 patch of the colors. It looked great there. I still had one more choice before I'd have to shop. It was an Oak Brown. (Top cone in the pic above) On the spool it looks like it could be pink in the right light. I was worried how it would look on the black but once I got going on the quilting I was very happy with my choice. Strangely enough, the fabric the brown thread played the least well with was the gold fabric that I love. That surprised me. I thought gold and brown would be friends. Still, it was close enough to keep me from having to shop. Best advice of all, just get in there and start your Sassy Sukoku quilt. It's a fun project. If you have questions you can leave them in the comments here or email me directly. RB.seamlesspiecing@gmail.com. Next week there will be a skill builder tutorial that may make your Sassy Sudoku quilt easier.